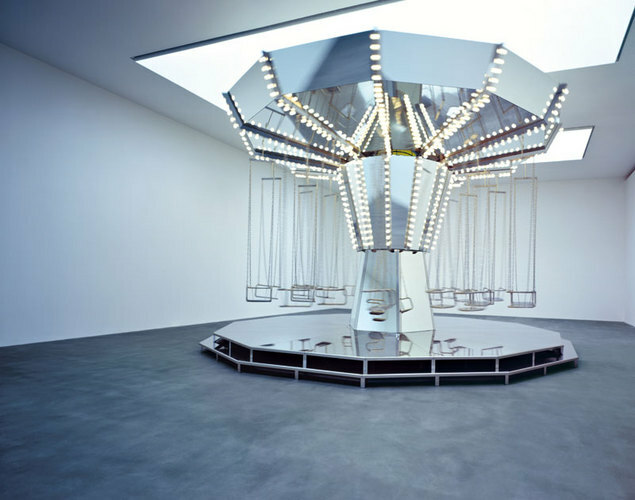 Last Friday, I went the New Museum to see the recently opened exhibition Carsten Höller: Experience. Born in 1961, the Belgian artist began as a scientist, completing his doctorate in agricultural science and only began making art in the late 1980s. Indeed, his work may remind one of a scientific laboratory, albeit more fun and engaging. From goggles that let you see the world as though it were upside-down, to giant mutant-looking mushrooms, to neon polyurethane animals with artificial human eyes, Höller sees the world through both scientific and artistic lenses. His Corridor of Experience, which many will mistake for the bathroom, are a series of small rooms that contain works that allow you to use your senses in atypical ways. An iPod connected to a pair of goggles that plays video instead of sound, a piece that gives the impression of your nose getting longer when you allow a vibrating device to touch your arm (The Pinocchio Effect), a bottle of phenylethylamine called The Love Drug, and other provoking works are worth the wait. The Mirror Carousel was also a treat, though sadly, swinging is prohibited. 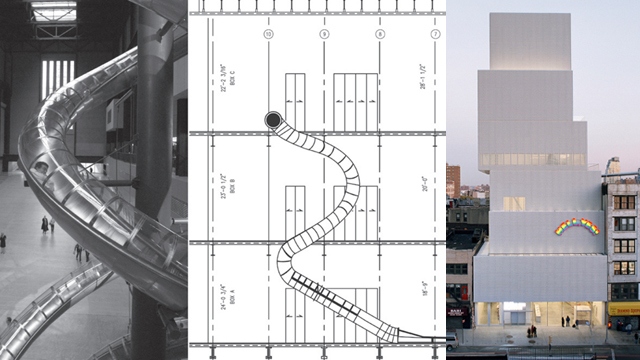 But my favorite piece is the 102-foot slide that connects the fourth and second floors. While this isn’t his first slide installation, it is the first that cuts through a building’s interior. I’ve gone three times and I can’t wait to do it again. The slide is “a non-surprising environment, completely predictable,” Holler says. “Yet when you put yourself in it, you have to let go, losing control. You have no means of mastering the situation. “I’m proposing to look at the world, at what other experiences you can have, how you can experience your whole outside environment outside your body,” Holler says.